I try to give people the benefit of the doubt. I really do. As a businessman, I understand the strategy and perspective that goes into many decisions that may not be apparent from an outside perspective. In short, I realize that “good” decisions may look like “bad” decisions to the uninformed. Conversely, my business experience has also shown me that smart, informed people sometimes make extremely poor decisions. The Jazz front office has been pursuing a stay-the-course strategy for years now. News flash: It’s not working. Actually I should clarify that. If their goal is to always be a mid-tier playoff team without any real shot at winning a title, then the strategy is working fine. If they, like most of us fans, have championship aspirations, then they need to make some changes. When the Jazz selected Gordon Hayward with the 9th pick, I was livid. I honestly felt like I had been punched in the stomach. I have since realized that my disappointment over that draft pick was really a culmination of frustration with management’s apparent unwillingness to be aggressive and take the necessary calculated risks to become a legitimate title contender. For the Jazz, it’s all about maintaining the status quo. They put out a winning product that makes the playoffs year after year. This allows them to sell enough tickets to turn a profit. That seems to be more important than winning a championship. As a business man, I get it. As a fan, I hate it. Prior to the 2006 NBA draft, the Jazz, after dropping to the 6th spot thanks to lousy luck with the ping pong balls, made an aggressive move to trade up to #3 so they could select Deron Williams, giving up 3 first round picks in the process. It was a gamble that paid off, and the kind of risk that championship teams have to take. 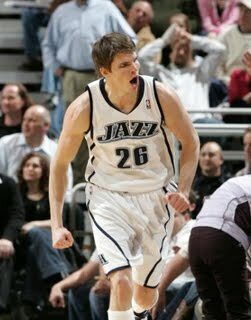 In 2008, Utah traded an expiring contract (Gordan Giricek) and a future 1st-round pick (which ended up being #23 this year) for Kyle Korver. Another calculated risk that arguably paid off. The Jazz needed outside shooting, and they got one of the best. Unfortunately injuries marred his performance somewhat, but it was still a smart move designed to make the team better. Since that time, however, the Jazz have retreated back to the ultra-conservative approach. This has been particularly manifest in the past 12 months. Need proof? Exhibit 1: The Jazz trade Eric Maynor and Matt Harpring to OKC for nothing more than salary cap relief. Exhibit 2: The Jazz trade Ronnie Brewer to Memphis for a conditional future 1st-round draft pick. Exhibit 3: The Jazz DON’T trade Carlos Boozer before the 2010 trade deadline, failing to acquire any assets in exchange for an all-star whom they were likely to lose for nothing in free agency. Exhibit 4: Jazz have thus far failed to trade Andrei Kirilenko and his valuable soon-to-be-expiring contract. Exhibit 5: Jazz fail to move up in the 2010 draft to acquire a potential star (i.e. Turner, Favors, Cousins) despite the fact that Philly was supposedly willing to trade the #2 pick to a team that would take Elton Brand’s contract. Exhibit 6: The Jazz NEVER acquire 1st-round picks for cash considerations. The Dallas Mavericks bought the #25 pick (Dominique Jones, a player I would have loved to see on the Jazz) for cash. Exhibit 7: The Jazz fail to work a sign-and-trade for Boozer, losing him to Chicago for nothing but a trade exception. Exhibit 8: The Jazz lose Kyle Korver (who, by the way, set the NBA record for 3-pt percentage last season) to Chicago for no compensation and reportedly didn’t even make him a respectable offer. I won’t enter this as official evidence since the jury is still out, but the Jazz also appear to be on the verge of losing Wesley Matthews for no compensation, as Portland gave him a bigger offer than Utah expected. I don’t recall ever feeling this frustrated with the Jazz organization, and I know many others who feel the same way. If Utah doesn’t match the offer to Matthews, they will have watched 5 key contributors from last season walk away with nothing to show for it but a lower payroll. 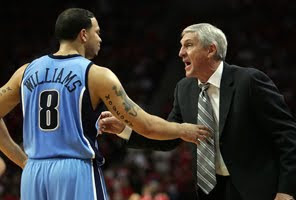 How is Deron Williams going to respond to this? Greg Miller and Kevin O’Connor had better pull a serious rabbit out of their collective hat (wanted to use another word there), or they stand to lose a lot of fans this season. Perhaps more importantly, they stand to lose their franchise point guard in two years.